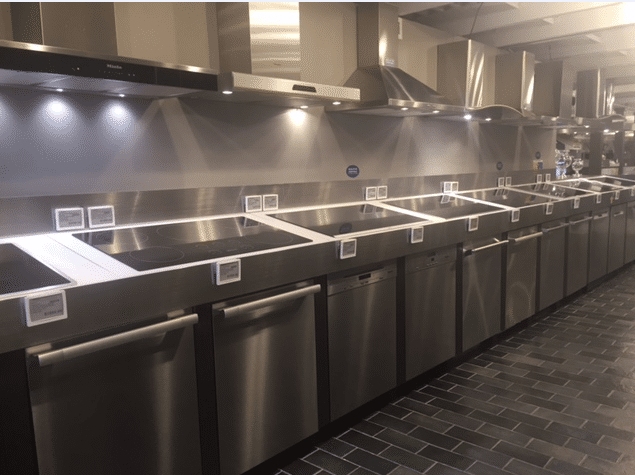 KitchenAid, Bosch, and Miele are three of the most popular dishwashers on the market today, but have not competed at $899 until very recently. What changed? 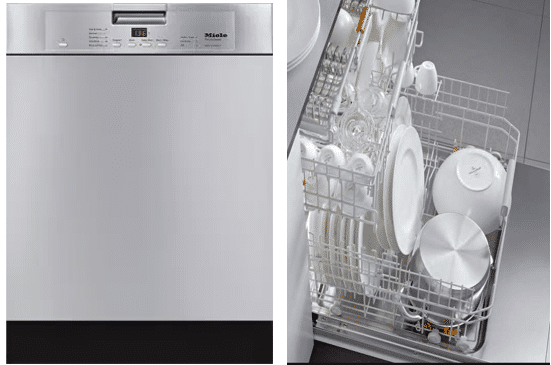 Miele recently introduced a new dishwasher under $900 and KitchenAid has introduced a very competitive dishwasher. 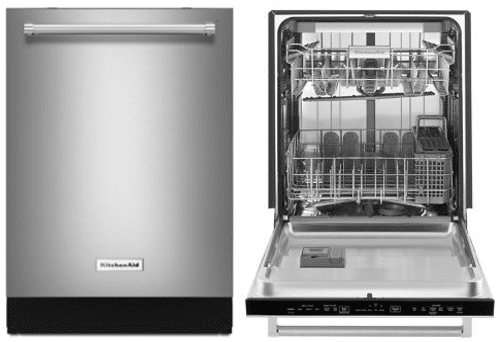 Miele dishwashers are normally $1,100 and up while KitchenAid and Bosch can be around $600-$1,000. At the same time, KitchenAid has always come in second compared to the quieter Bosch dishwashers. KitchenAid is part of Whirlpool corporation which is one of the largest appliance brands in the world. KitchenAid is a premier brand of Whirlpool and continues to be very reliable. KitchenAid was started by the commercial Hobart company and was the first premium American dishwasher. Bosch is a multinational German-based company that produces everything from home appliances to power tools. Bosch was started in 1886 by Robert Bosch. Even though Bosch is based in Germany, they have been producing their dishwashers in North Carolina since the 90's. A lot of their appliances are now being assembled in the USA. Bosch is part of the BSH corporation which also includes appliance brands such as Gaggenau and Thermador. Miele was founded in 1899. It is an independent family-owned company which focuses on home appliance production as well as machines for commercial applications. Miele strives to be among the best in the appliance industry. 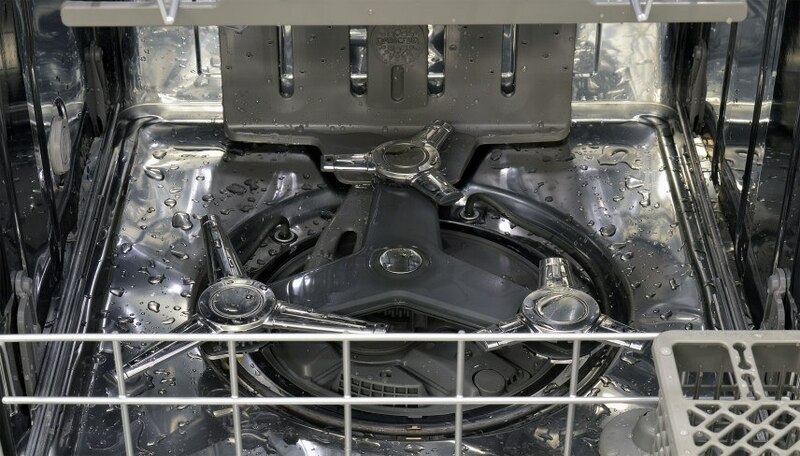 Since Miele manufactures almost all of the components in their dishwashers, they have better quality control on their end making their dishwashers more reliable than others. The only part Miele does not make on their dishwasher is the wheels on the racks. Keep in mind, prices include rebates that are now in effect. They do change monthly. This KitchenAid is a great dishwasher. From the silence rating of 39 dBA to its big capacity, it is one to consider. 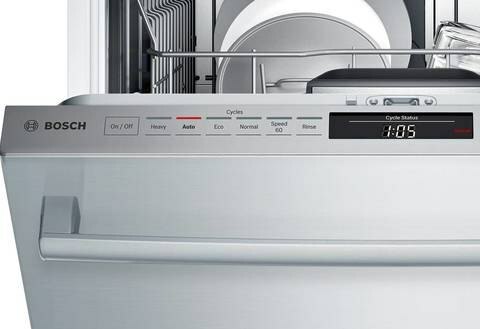 Thirty-nine dBs is 30% quieter than Bosch and 60% quieter than Miele (click here to listen to some popular dishwashers). 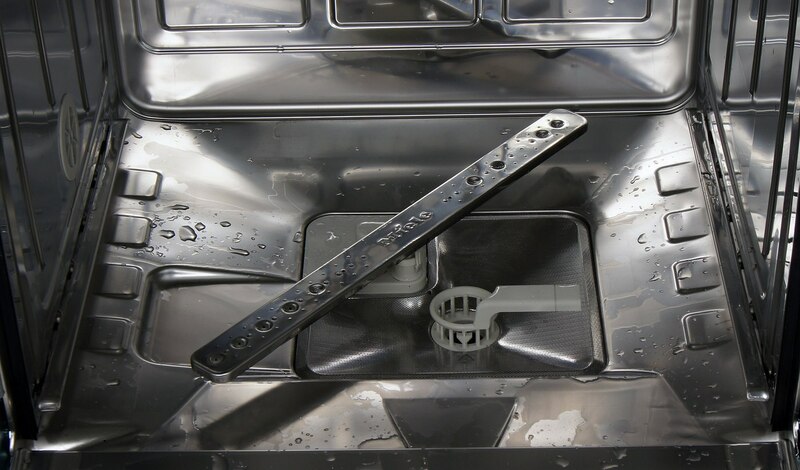 This is an American style dishwasher and they tend to be a bit bigger on the inside so if you have a large family, you may want to consider this one. Of course, it does not sit flush with the cabinets like the others. You will only notice this when you place a panel on a dishwasher. It also has a heating element for better drying. The ProScrub system has concentrated jets in the back for baked on stains. Like the others, KitchenAid has the third rack for silverware. This Bosch dishwasher is a popular one because of the clean look and no handle. It has hidden controls and shows a red light on the floor when the dishwasher is running. 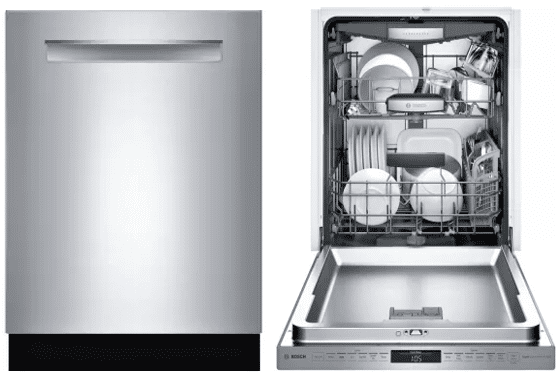 This dishwasher pretty much has all the cycles and options that you can buy in a dishwasher. You may end up not using half of the cycles. Bosch also offers some great incentives when you buy this dishwasher as part of a kitchen package. This is a great dishwasher with your normal wash cycles and great drying. What I like most about this dishwasher is that it is made in Miele's own factory in Germany, so the reliability is the best. You do not have the blizzard of cycles like the other two. You will probably only miss the China and Crystal Cycle. 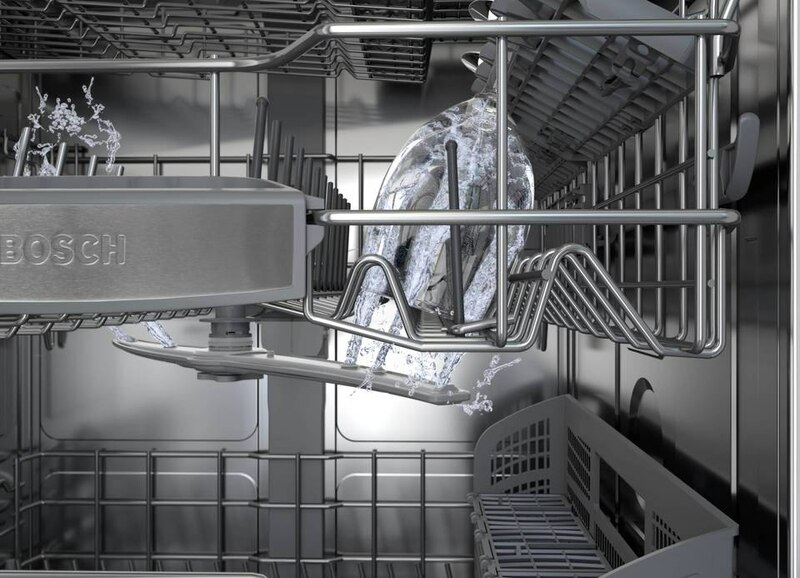 However, it is the best drying dishwasher because it has a port to bring cool air into the outer sides of the dishwasher which then cools it down to help evaporate the water. This is easy: KitchenAid is the lowest at 39 dBs. All three are good, but 39 is unbelievably silent. All three are adjustable, but KitchenAid has more side to side adjustability. KitchenAid uses a heating element, but adding heat to an already hot interior does not help much. The Miele system of adding outside air is way better. All three have a top third rack, but only Miele has a full wash arm vs. KitchenAid's smaller arm and Bosch's sprinkler which is similar to a shower head. At the same time, KitchenAid has the ProScrub for baked on dishes. This feature is like putting your thumb on your hose to concentrate the spray. Miele is number 1, but Bosch is close requiring service only 1.5% more in the first year, whereas KitchenAid is average. So, what do you buy? Depends on what you want as they offer different values for your lifestyle. 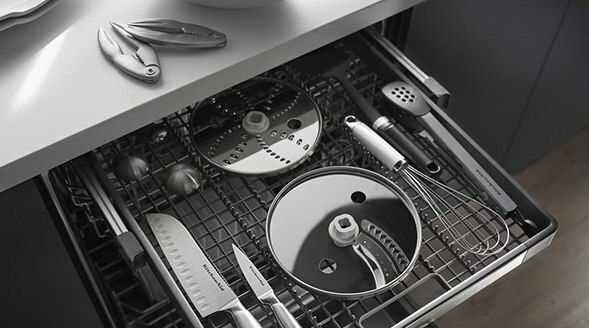 KitchenAid has the best combination of cycles, washing, quietness, and overall racking. 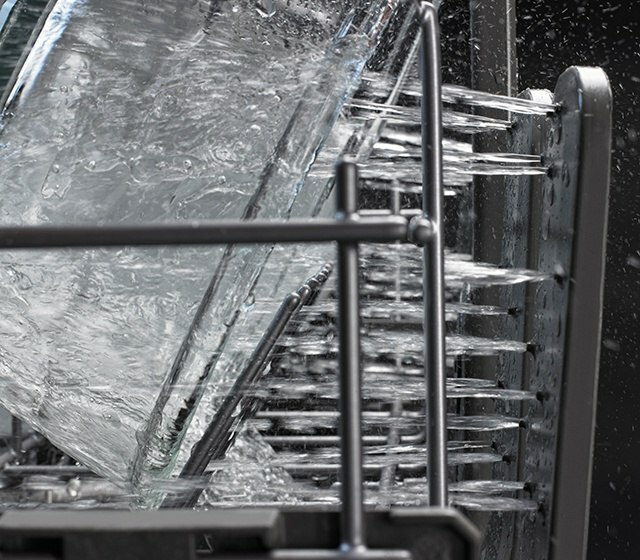 Bosch has a good combination of quietness, cycles, and reliability, whereas Miele offers a good combination of washing, drying, and reliability, too. Overall, all three are worth considering. 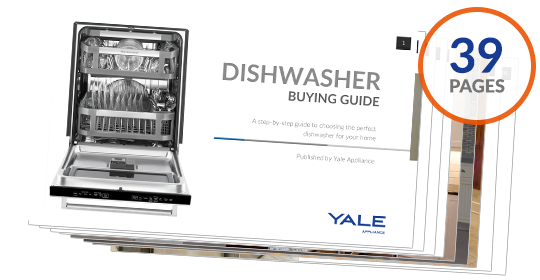 Download the Yale Dishwasher Buyers Guide with features, specs and insider buying tips to every major dishwasher. Over 180,000 people have read a Yale Guide. Roger Pontes has been with Yale Appliance + Lighting for over 10 years. He’s worked in both the lighting and appliance department over the years. Roger truly enjoys helping people. He’s a married father of 2 kids, a boy and a girl. On his spare time Roger enjoys spending time with his family and playing sports.